A team of researchers has developed a squeezable mouse-like input device that gives three-dimensional control to its users. The device is called Suma, short for satsuma or the mandarin fruit, said Duncan Smith, head of consumer product development for Cambridge Consultants, which licenses its innovations to manufacturers. 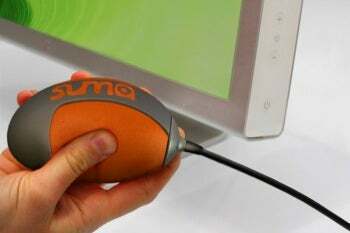 Cambridge Consultants is developing several versions of Suma that will be shown in January at the Consumer Electronics Show in Las Vegas. The company can't reveal too much as it is in the process of filing for a patent for Suma, but it is releasing some details. Inside Suma's pliant foam are light actuators surrounding a sensor core. As Suma is squeezed, those actuators detect pressure and movement changes. Those signals are processed with software inside Suma and then sent to the software program that can accommodate the device. The difference between Suma and a controller for Nintendo's Wii, for example, is that the motion-based controllers allow users to move objects but not manipulate the shape, which has the potential for a new range of applications, Smith said. The Suma is "very much a whole picture of the inside of your hand," Smith said. It's possible, for example, to manipulate the viewpoint of both the user and the object the user is looking at simultaneously, which is not possible with controllers now, Smith said. Smith said developers have also put an accelerometer inside Suma, which allows for more movement control. Although Smith stressed that the software for Suma would come from elsewhere, his team has developed what he described as an "addictive" ball game that runs on a Linux OS and shows what Suma can do. The ball game will be part of a demonstration at CES, where Cambridge Consultants hopes to pique the interest of peripheral makers and software developers. One Suma model has a cord and runs off of USB (Universal Serial Bus) power. In order to use Suma, devices such as gaming systems or PCs would need a new driver, but it not difficult for Suma to be recognized as a standard peripheral, Smith said. Inside Suma's core, there is some software that translates the actuators' signals into a more standardized form. Cambridge Consultants has developed a low-end version of Suma that is less sensitive to pressure but also cheaper to produce. With more expensive components, Suma can be made into a more sensitive, precise device. Gaming and 3-D applications are obvious for Suma, but Smith said his team believes it could have medical-related uses such as for the disabled.